I’m a proud participant of the successful attempt to get the Guinness World Record of the most downloaded software within 24 hours. I even got a certificate. It’s in German though, but I guess you get the idea. I belong to over 8 million people who helped to make this world record happen. Until now I’m pretty happy with Firefox 3, even though I’m still missing some really good Add-ons to be Firefox 3 compatible, like Tab Mix Plus. But I was surprised that Google Browser Sync won’t be available anymore. Instead you should switch to Mozilla Weave. For everybody who doesn’t know what Google Browser Sync or Mozilla Weave are, these are 2 Add-ons, which continuously synchronizes your browser settings – including bookmarks, history, persistent cookies, and saved passwords – across your computers. It also allows you to restore open tabs and windows across different machines and browser sessions. I was always happy with Google Browser Sync, whereas Mozilla Weave still has some bugs. Ok, it’s just Version 0.25 but some things are not working so great right now. For example, it takes sometimes several minutes to synchronize after shutting down Firefox. It took only seconds with Google Browser Sync. But I’m sure the developing team will work hard on these kind of bugs to fix it very fast. Actually they do, almost each week they are coming out with a minor release. You can download Mozilla Weave here! Another interesting Add-on is RAM Back, this add-on only clears the internet memory cache of sites not currently loaded in your browser. Sometimes I have over 100 tabs open for days and it happens that Firefox uses 1,2 GB Memory since already closed websites are still in cache. I’m forced to restart my browser to free up some RAM, fortunately that is not necessary anymore with RAM Back. 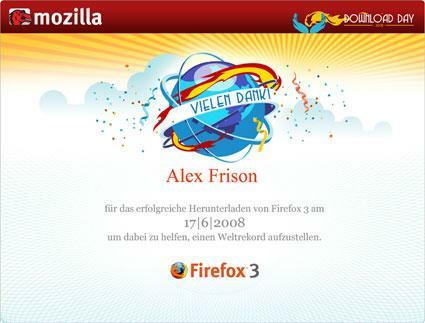 I really like the first draft of the new mozilla logo, what do you think? For a moment, I thought that was a picture of the back end. Anyway, a nice (fire)foxy pic. I think the critter has found what it was browsing for. I just downloaded FF3 as well and I like the faster speed. Haha you certainly know how to get someone’s attention with a picture! I’ve been holding off on FF3 for exactly the issues you mentioned, specifically addon compatibility. There needs to be some compelling reason for me to go through the pain of dealing with some 20 odd addons I have. Several addons I use are pretty unique, so until there are v3 compatible versions for most if not all ov them, I’m staying with v2. It was tabbed browsing that made me switch from IE to Firefox, is there a similar killer feature for v3 that I’m missing out on? > A killer feature? It’s much faster than FF2! Is that really a killer feature? Perhaps I’ll install it on my old laptop and see if that makes a difference. Hey Simon, how is it running on your old laptop? Not got round to it yet. Not got round to it yet. Will let you know when I do.